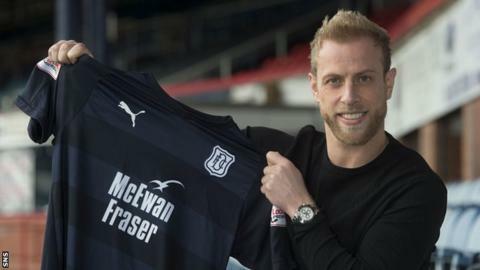 Dundee's January signing Andrew Davies will have to wait until next season to make his debut after breaking his foot for a second time in three months. The centre-back was injured in training days after joining but was close to a return before breaking the metatarsal again in training last week. McIntyre confirmed the 34-year-old will have surgery and sit out the rest of the Scottish Premiership campaign. "It's a massive blow for all concerned, but none more so than Andrew," he said. "He is in a very low place at the moment, because he had been back on the training ground for a week, looking exceptional, and he has done so much hard work. "It has been especially disappointing because I expected him to make a big difference to our situation and unfortunately he has not been able to do that." The news about Davies comes as the Scottish Premiership's second-bottom side prepare for Saturday's relegation battle at bottom side St Mirren. Dundee can open up a four point gap over the Paisley side with a win, but will drop to the foot of the table if they lose. "It doesn't really get any bigger, but nothing will be decided after this - there are still seven more really important games to go," McIntyre said. "When you are in our situation, it is about picking up points and we have a real opportunity on Saturday to do that. St Mirren will see it the exact same way." Dundee will be able to call upon striker Andrew Nelson, who has recovered from the heel injury which has kept him out since the middle of last month.